Knife River works on Riverside Drive Monday just west of the Portland & Western railroad track. Safety improvements on Riverside Drive are getting closer. 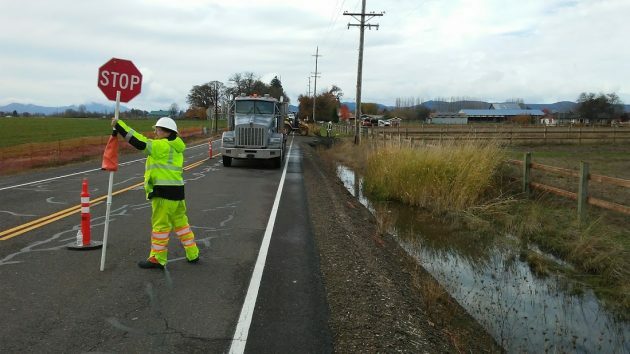 On Monday I saw the first construction activity that’s part of Linn County’s move to widen the road. A crew for Knife River was installing a couple of driveway culverts ahead of widening the road in 2018. Work on the actual widening may start in January or February, depending on the weather, County Engineer Chuck Knoll told me. Knife River Corp. in Tangent has a $1.9 million contract with Linn County to repave Riverside from Oakville Road just outside of Albany to Meadow Road, 2.4 miles away. The contract has a completion date of June 22, 2018. The road now is between 22 and 30 feet wide. The project calls for two 12-foot travel lanes and 4-foot paved shoulders on both sides, making a ribbon of pavement 32 feet wide. As is customary, a fog line will mark the outside of the travel lanes, turning the paved shoulders into de-facto bike lanes even though they’re not called that. As an occasional bike rider on Riverside, I’ve been looking forward to the wider shoulders because in some segments now there is hardly any space outside the travel lanes. Riverside is about 6 miles long from Oakville Road to Highway 34. The rest of the road may be widened later when it, too, comes up for redoing the pavement. At its south end, Riverside connects with an off-highway bikeway to Corvallis. ODOT finished that bikeway in late 2015. I’m glad Riverside Drive is being worked on. I hope they don’t make it straight, as then everyone under 65 years of age drives too fast. Hasso, to ride a bike on Riverside Dr. or Oakville Rd. is risky. I am happy Riverside is getting wider shoulders as I have had several close encounters with the ditches. As a young lad in the early 1960s I biked back and forth from my home to Riverside School every day. And although my parents preferred that we (myself and all my siblings) ride the long way around on Meadow and Walnut, we frequently rode the white stripe on Riverside Drive. I think sometimes we would go the entire way without seeing a car. And when we did, they would slow down and give us a wide berth. When I drive down memory lane now (Riverside) I am flabbergasted by the houses and traffic. The recent editorials in the DH about both population and economic growth make me pause to think about what the Riverside area will look like in another 50 years. Just today I witnessed a postal delivery driver trying to avoid being hit by passing cars as she drove along the narrow shoulder of Riverside Drive. She was doing her best to avoid the traffic passing her. Her small jeep Postal Vehicle slid off into the ditch. Fortunately she was not injured and no mail was lost. Having lived here for a number of years I’ve seen approximately eight or nine vehicles end up in the ditches due to the narrow shoulders. Hopefully this improvement will make this road safer for both drivers and bicyclists. I passed the construction area yesterday and a half mile further west, I stopped to see if help was needed as the US Mail carrier was in the steep ditch, on it’s side, with carrier sticking their head out the window. Clearly left mailbox, caught shoulder and rolled over. One person there already, said help was on the way and carrier was ok. Riverside, like many of the rural roads, have absolutely no room for error, so improvement is much appreciated! Will Hering’s “de facto” bike lanes be recognized as such in potential legal proceedings? It isn’t clear from the article how ODOT is handling the widened edifice.